Over the years we have developed some of the finest carpenters and joiners in the country. For many of our competitors, that dedication to an old art and craft has gone, but our apprenticeship programme is as relevant today as it has always been. We continue to take on young people and pass on the established skills of those that have gone before them. We believe that it is this commitment to youth and training that is the driving force behind our company’s ongoing existence and drive to improve and develop our craftsmanship thereby ensuring we produce some of the finest hand-crafted product available. One of our master Joiners explains what the apprenticeship programme means to him and the importance of it to Hawker Joinery. 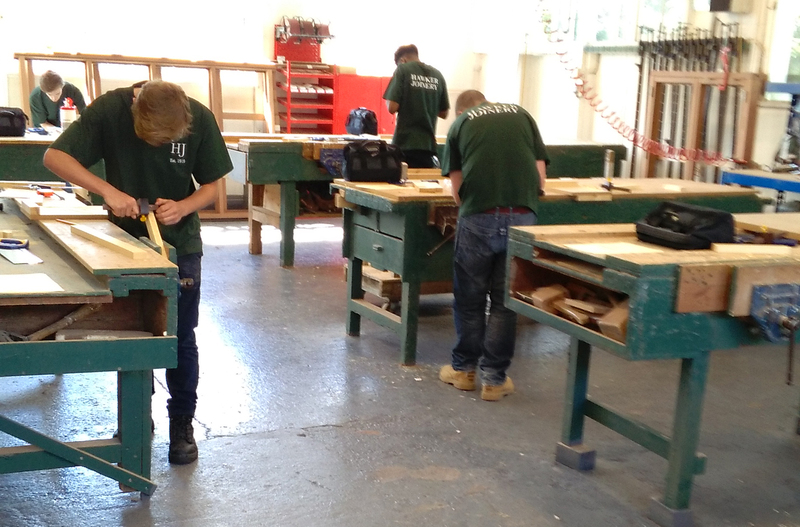 With the kind help of Siobhan Mologughney and her team from Bath College we set up the Hawker Joinery Apprentice Training Day, our hope is this will become the gold standard for Carpentry. We invited potential apprentices to meet me at the college where we gave a talk on the benefits of not just becoming a joiner but becoming a ‘Hawkers Joiner’. We were indeed pleased and overwhelmed by the response of over forty applicants, six with another two in reserve were put forward by Bath College. On a beautiful sunny Saturday morning the six candidates met with me at the Fat Friar for breakfast. Well if their appetite for a full English is as good as their carpentry I knew I would be on to a winner. After an induction and factory tour, the lads were presented with their task to make a four-sided frame, the same frame my colleague Nigel Hodges made for his apprentice piece some forty years earlier. Having completed their practical tasks, each apprentice was interviewed to find out a bit more about their personality and interest in the trade. They were given the opportunity to share pieces of work they had previously done and talk to me about their desire to make a career out of joinery. These discussions just seemed to make my task of selecting just two from six all the harder! I enlisted the help of my colleagues Andy White and Nigel Hodges to make the final decision and I am pleased to say it was something of a relief when we all settled on the same candidate to take forward. A big thank you to all the all the lads who took part in the apprentice day and I hope you put those tools to good use!